Inside: Save money on groceries when you are broke or not. 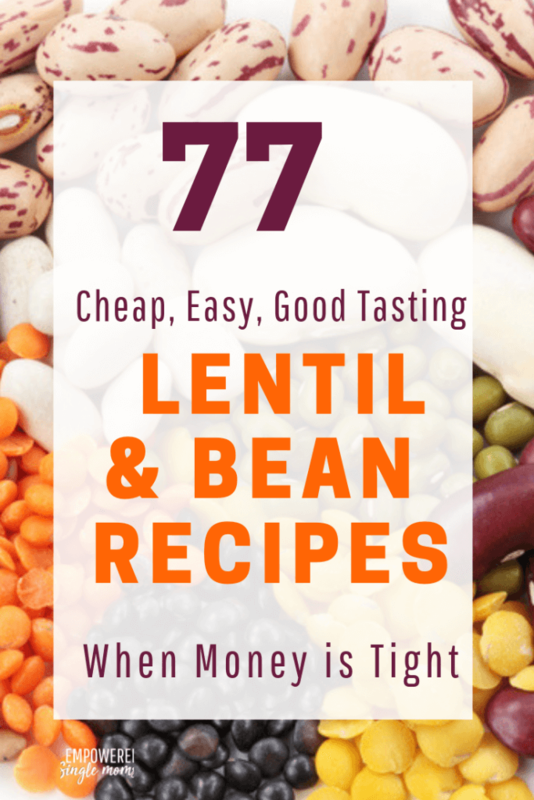 You will want these cheap, delicious recipes even when you can afford more than poor people food. We all spend a significant percentage of our budget on buying food. One of the best ways to save money on groceries is to plan meals around cheap ingredients. Beans are one of the cheapest sources of protein available. Find out what the other cheap ingredients are in How to Make a Cheap Grocery List When Money is Tight and plan your menus around these ingredients. Planning meals saves money because you eat at home more and waste less food. Planning meals around cheap ingredients keep costs as low as possible. If you have rarely cooked with beans you may wonder do I use canned beans or dried pinto, kidney or black beans? Cooking dried beans is cheaper than using canned beans but takes more planning. You can cook up a pound or two of dried beans and freeze them in 1-2 cup portions and they will be as convenient as canned beans once they are cooked. How Do I Soften Dried Beans? Don’t be intimidated by cooking with dried beans. You soak them, drain the water and then cook them. Draining the soaking water reduces gas people get from eating beans. I usually wash the beans by putting them in a colander and rinsing them off. Then I put them in a pan and add water until it is a few inches over the top of the beans. Bring the water to a boil. Turn the pot off and let it sit for a couple of hours or more. Drain the water. Now your beans are ready to cook for one to three hours. Different varieties are different so check the package. Other options are to use the process above, but instead of bringing them to a boil let them soak overnight. Or you can cook them in a pressure cooker or Instant Pot. If you like them really soft cook them for 40-45 minutes in your Instant Pot. What is Good to Eat With Beans? Grains or dairy make beans a complete protein. Bread, tortillas or rice are all traditional accompaniments to bean dishes. How Do I add more beans to my diet? I often strategize with people on how to cut down on what they spend on food. Usually, they easily understand cooking at home more and eating out less is good for their pocketbook. They also get that planning meals to cook at home is a big help to make that happen. Often when I suggest eating more beans and lentils I’m met with either, “I don’t like beans” or a wrinkled nose. I think this is because of a lack of knowledge. 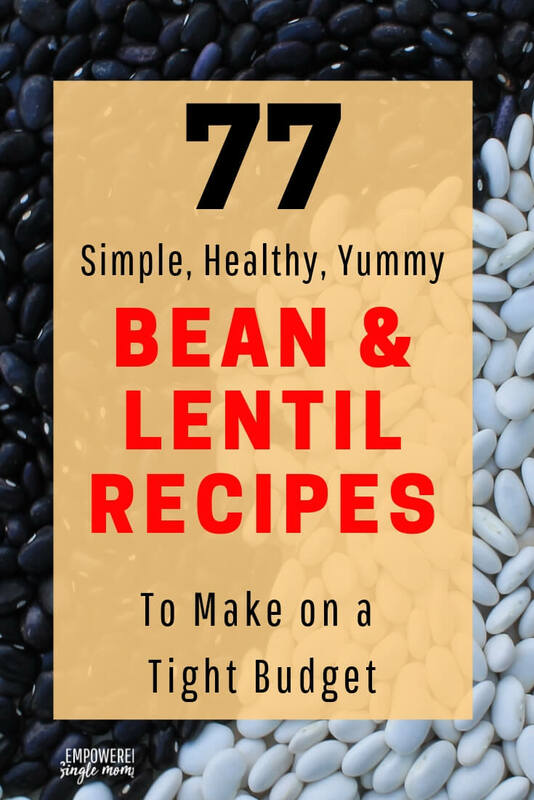 There are so many different ways to cook beans & lentils that you have a different tasty lentil or bean recipe every day of the month. To prove this to you I went to the internet and searched blogs for tasty, cheap bean and lentil recipes. I am sure you can find a few you will want to try. An advantage lentils have over beans is that they need no soaking and cook fast. Wonderful food for busy, budget-minded parents. There are many variations of lentil soup. If you’ve never tried lentil soup you are in for a treat. This recipe calls for gram marsala, which is an Indian spice blend. One type of gram marsala is very different from the next because some have more of one spice than the other. My favorite is one that a friend brought back from an Indian market in California. If you don’t have an Indian market near you Amazon has several to choose from. I prefer blends that don’t have cinnamon or cloves as the first or second ingredient, but you may have a different preference. You can eat hummus as a dip or spread it on a wrap with loads of vegetables or spread it on your toast. Black beans are my favorite bean for burritos. Pinto beans are traditional in Mexican cooking. Which of these yummy bean or lentil recipes are you going to try? Find more budget minded meal ideas in More-with-Less Cookbook (World Community Cookbook) and Dining on a Dime Cookbook.